This is the third release in the Immersion series, released in 2007. 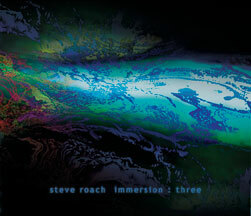 It is a 3-CD set of (at the time all new) material (different pieces from immersion : one & two. “The Mark Rothko of electronic music.” The third release in the Immersion series is a 3-CD set of focusing on ambient “zones” created as tone meditations for the living space. With one composition per disc, this is a remarkable release in the long-form ambient genre; the nearly 4 hours of material display Steve’s quiet mastery of immersive ambient soundworlds. Gently effective at low volume, the non-dynamic nature of these spaces supports focused day and night activities. Minimal in nature and sonically uninterrupted, each disc bring Steve’s years as a soundpainter of deep subtle spaces to a rarified focus. Immersion : Three is perfect for creative states, sleeping, reading, long hours at the computer and other functions where traditional music could be considered invasive. This release is especially effective in dissolving the sense of linear time. This is the “second standard retail edition” packaged in a 3-CD ecoWallet. This album was originally released in 2007 as a mail-order special edition in a DVD-sized digipak. limited to 1000 copies. Simultaneous to that was a CD-sized digipak edition. Both of those are sold out. This is the new environmentally-friendly ecoWallet edition. Same great music, naturally. 222 minutes. Focusing on ambient “zones” created as tone meditations for the living space, immersion : three is a stunning new release in the long-form ambient genre. With one composition per disc, the nearly 4 hours of all-new material on immersion : three display Steve’s quiet mastery of immersive ambient soundworlds.